I made a pizza dough with a recipe containing: 20 ounces of wheat, 2.25 teaspoon of Salt, 1/2 teaspoon of active yeast, 12 ounces water. After a good time of kneading, I let it rise for around 2 hours. Then I made balls. Already I could tell the dough was very humid and bubbling. I let the balls at room temperature for around 10 hours and after, when trying to shape them, they are way too sticky. Unless the recipe has an issue, is there any tip for handling sticky doughs for shaping pizzas? Just as an aside, the first time this happened was by accident when I was bringing dough to bake at someone else's house at a party. I had assumed I would be baking almost immediately after I arrived, but we ended up socializing for several hours before baking the pizza. I was concerned that the dough would be incredibly overproofed and might have a strange flavor, but it was frankly one of the best pizzas I've ever made. So now I sometimes do it on purpose. It can be done to excess though -- eventually, an overfermented dough will bake unevenly and will lose some flavor notes (as well as potentially gaining an excess yeasty or beer-like taste). In any case, given your batch size and initial quantity of yeast, this does sound like too long of a room temperature fermentation. For 12 hours at room temperature total, I'd probably start about 1/8 tsp. yeast, and I agree with other answers that it would be better to do the shaping closer to the end, with the longer fermentation at the start. Or keep the recipe proportions and retard in the refrigerator for part of the time. Now, to respond to your main question: how to deal with sticky dough, once you have it? (2) Whether or not you have the flour under the dough balls already, I'd take a bench knife (or wide metal spatula, if you don't have a bench knife), lay it flat, put a decent quantity of flour on the top side to prevent sticking, and use it to carefully get under the dough ball (likely more like a spread disk after a long ferment) from all sides. Gradually work toward the center of the disk to free it completely. (4) Stretching will be complicated with overproofed dough, because it tends to become much more slack as gluten breaks down. You may find that you don't need to "stretch" at all; the task will be trying to keep the dough from ripping apart from its own weight as it stretches itself downward. (This will be particularly true if you used flour without a lot of gluten, but even bread flour that is well-kneaded can turn slack when overproofed.) Just work very quickly, holding the dough with your fists underneath, pulling them apart very gently -- if you haven't practiced dough stretching on firmer dough, this is NOT the dough to learn on. You probably will not be able to "toss" it -- just gentle stretching with fists and perhaps thumbs to work near the edge. (5) At some point, with overproofed dough, you will probably have to drop the dough onto the peel early (before it's fully stretched or in a nice circle). Don't wait for it to rip: better to drop early if needed and fix it. As long as you have enough semolina there, you can continue to pick up sides of the dough and stretch it out to a good shape. Just be very careful to NOT touch the top of the dough, which will inevitably be very sticky. (6) The dusting of the bottom and the semolina on the peel will help to prevent sticking, but with a very sticky pizza dough, you'll need to shake the peel often while preparing for the bake. Otherwise, moisture will seep down, bits of the dough will stick, and you'll never get the thing off the peel and into the oven in one piece. So, you'll probably want to shake at least after every topping addition: put on sauce, shake, add cheese, shake, put other toppings, shake. If in doubt, SHAKE. Then shake a final time to be sure it is loose before going into the oven. (You do NOT want to be surprised when the dough is 1/3 of the way off into the oven that the back part of your dough is stuck on the peel.) If at any point some part starts to stick, get your bench scraper and some flour or more semolina and get under the dough to free it immediately. (7) When unloading your dough into the oven, be very careful to pull at a constant rate. Slack overproofed dough will easily deform during unloading, so you could bunch up your pizza if you slide it off too fast, or you could rip a giant hole in the bottom if you pull back too quickly (which will be one heck of a mess -- hint: go turn your smoke alarms off immediately if this happens). Assuming you managed to get the thing into the oven in one piece, you're good to go. If you didn't enjoy this, next time you make pizza, try to avoid the sticky dough problem. On the other hand, if your pizza comes out so good that your friends rave that it's the best pizza they've ever eaten (as happened to me), consider learning to handle sticky, slack, overproofed pizza dough. It is sometimes a handy skill. A super sticky dough is exactly what you want for pan pizza. Take a look at what Kenji from Serious Eats has to say about pan pizza dough. He uses a super-sticky, no-knead dough, but I bet yours would be fine for this application. 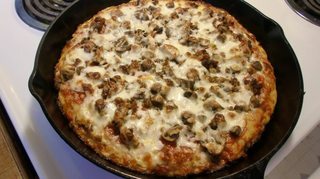 I followed Kenji's advice to make this pizza, it was the best pan pizza I've ever had. Using the pan made dealing with the sticky dough a breeze. With a lean dough you can either use oil on the working surface and your hands to make it easier to handle, or a coarse milled grain like cornmeal or fine semolina. Personally I prefer semolina, as it is easier to clean up than oil, and cornmeal clings to the dough and gives an odd mouth-feel. A further point: you mentioned leaving the dough balls for ten hours at room temperature. This will result in extremely overproved dough. The second rise should be no longer than an hour. If you want to do a long, slow rise for flavour, it should be the first one, and it should be cold (ie the fridge), not room temperature. Not the answer you're looking for? Browse other questions tagged dough pizza non-stick wheat kneading or ask your own question. When kneading bread dough, how sticky is 'too sticky'?